From my site’s analytics I know that the Andaz review was a very popular post. If some of you are wondering if free luxury travel is something you can attain too, take a look at Nicoleen’s and my monthly points totals. I give the breakdown every month so you can see what an average household (I think our income and spending is close to average) can expect to earn as far as points and miles go. – Hotel Review – BUILDING 7-73 is a bit of a joke, since the “hotel” is actually a lodging complex on an Army National Guard base. Reading this review and the following one highlights the vast range of accommodations available on this planet. – Hotel Review – Andaz Maui at Wailea is the first of several posts reporting on our recent trip to Hawaii. If you haven’t read this post, please check it out- the photos alone are worth a look! Nicoleen called for a retention offer on her AAdvantage Aviator Red from Barclaycard just before the annual fee posted. The agent said he had no offers for her but she was “likely to have some available on the account after the annual fee hits.” He told her to call back after the AF posts and try again. Helpful agent! I’ll definitely take them up on it, especially for the grocery store bonus. I’ve been using my Chase IHG Platinum Rewards card for the 3x it earns on groceries. 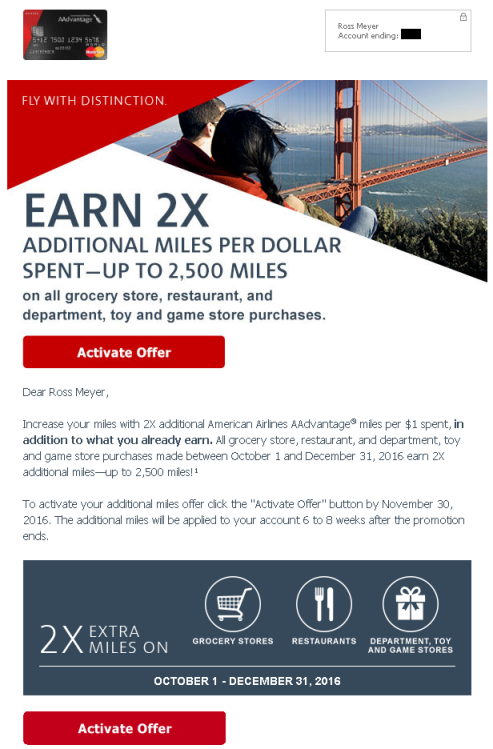 But 3x AAdvantage miles are worth more in my book. As always, keep track of the VT FB page for updates! Expect to see some more trip reviews from the Hawaii trip online soon! This entry was posted in American Airlines, Barclaycard, Weekly Updates on October 3, 2016 by Gomanson.